Former president calls for “communitarian consciousness” to solve world’s ills. After being hooded by Chancellor Arnold Steinberg and Victor Dahdaleh, McGill benefactor and Clinton family friend, the 42nd President of the U.S. took to the podium where he proceeded to captivate his audience for more than an hour. 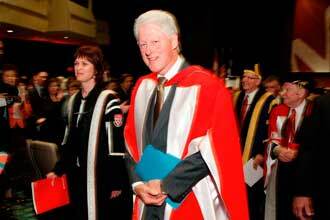 “I am profoundly honoured to be here at this magnificent university and to be honoured in the way President [Franklyn Delano] Roosevelt was,” Clinton began, referring to McGill conferring Roosevelt with an honorary degree in 1944. “I am particularly grateful for the priority that McGill has placed on making serious commitments to broadly shared prosperity, sustainability in the face of climate change, reaping the progress and promise of science and technology, promoting wellness and health, and trying to deal with the amazing array of diversity that exists in our countries and throughout the world that has to be both respected and reconciled,” he continued, setting the stage for a discourse that was impressive in both scope and sentiment. Clinton told the 700-member audience and those watching via webcast that the world was staring down a three-headed monster of inequality, instability and unsustainability. The picture he painted of the current world situation wasn’t rosy, citing growing discrepancies in education, wealth and access to healthcare, along with the ever-present spectre of global terrorism and climate change. “We’re headed for rough waters,” he said. Although he didn’t offer any solutions, Clinton did dedicate much of his time at the dais positing a framework with which these problems could be tackled. “These challenges cannot be met unless we meet them together. We have to find a way to go forward together. He criticized western governments for sometimes having tunnel vision when responding to world crises. Rather than just air dropping mass quantities of North American produce to areas suffering food shortages, Clinton says our governments should also be helping those same countries build the proper infrastructure and sustainable systems needed to produce their own crops. “The whole thing is a fool’s errand,” he said, calling instead to “increase people’s capacity to feed themselves, to store food, to transport food, to work out delivery mechanisms, and to have an efficient supply chain. But Clinton, the man of many words, also drove home the point that “this to be as much about doing as well as talking,” stressing that we shouldn’t rely solely on government officials to effectuate meaningful change. “One of the great advances in the 21st century is that the power of citizens to effect the course of their own destiny and the world’s destiny is greater than it has ever been,” he said. Often leaning on the podium with one elbow and peering over his glasses, the master orator captivated his audience with his encyclopedic knowledge of world issues, touching personal anecdotes and, of course, a healthy dose of homespun Clinton humor. Elsewhere in his speech, Clinton referred to Quebec referendums on separation from Canada with the aside, “By the way, I’m glad you didn’t get a divorce.” He turned the applause for that remark into laughter by admitting to the audience “that’s the great thing about not being President any more – you can say whatever you want. Clinton anecdotes, though often laden with tragedy, also inspired – the Rwandan mother who awakens in a pool of blood of murdered family members who starts an orphanage and later forgives one of her children’s murderers; and the Indonesian tsunami victim who lost nine of her children only to name her newborn Dawn in honour of a new beginning.